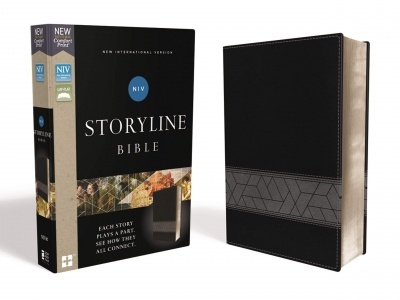 Home » Bibles » Black NIV Storyline Bible: Each Story Plays a Part. See How They All Connect. Black NIV Storyline Bible: Each Story Plays a Part. See How They All Connect. Journey through the interwoven story of the gospel from Genesis to Revelation. The NIV Storyline Bible features over 380 articles paired with book introductions that illuminate the interconnected nature of God’s inspired Word. The content adapted from Biblemesh.com explores major events, key characters, and the theology of the Bible over seven historical eras: Creation / Patriarchs / Moses / Israel / After Exile / Jesus / The Church.